Fantastic Beasts: The Crimes Of Grindelwald Review: From the get-go, it is evident that the second film in the prequel/spin-off to the ‘Harry Potter’ series is geared towards its dedicated fan-base. 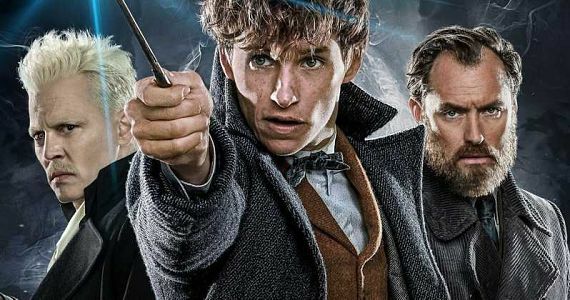 The focus firmly shifts from Newt Scamander and weighs down heavily on Grindelwald and his devious plans. The plot then veers away from what made the previous entry charming and fascinating; that is, those fantastic beasts. This is a much darker and grimmer film, perched largely on the shoulders of two of the most recognisable members from the ensemble cast – Johnny Depp & Jude Law. Depp gives his most menacing and restrained performance, thus infusing the adequate amount of intrigue into Gellert Grindelwald – one of the most feared and powerful wizards in the Potter universe. Equally fascinating is Grindelwald’s relationship with Albus Dumbledore (Jude Law), and how the fate of the world largely depends on the latter’s reluctance to engage with his former friend and ally. Law’s charismatic turn as the beloved wizard carries potential as he is bound to play a more significant role in the sequels to come. ‘The Crimes of Grindelwald’ makes it evident that this is the story of his Past. While there are ample references to Hogwarts and cameos to satisfy fans, ‘The Crimes of Grindelwald’ has a lot of dense exposition that’s bound to baffle others. Director David Yates tries to balance this out by making the action set-pieces engaging, but the transitions from the character conflicts to CGI sorcery are clunky at best. All the dazzling imagery and ominous atmosphere can’t shake off the feeling that this is more setup than a standalone entity. However, it appears the training wheels have come off, promising that the next entry in the ‘Fantastic Beasts’ saga will go full throttle into J.K. Rowling’s world of wizards. If nothing else, that’s bound to ensure Potterheads will stay tuned to the franchise. Previous articleRanveer Singh, Deepika Padukone debut as Mr & Mrs!